HMS Argyll successfully conducted the first firings of the Sea Ceptor system, an event being heralded as a major milestone for the Royal Navy (RN) as it brings its upgraded Type 23 frigates back into service. 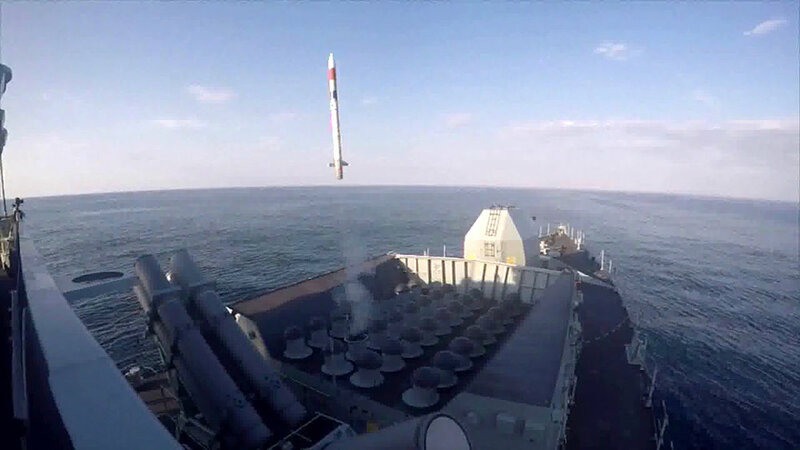 The Sea Ceptor system, which utilizes MBDA’s next-generation Common Anti-air Modular Missile (CAMM), is being fitted to replace the Sea Wolf weapon system on the Type 23 frigates as part of their life-extension program, MBDA noted. Sea Ceptor will provide improved protection for the RN against anti-ship cruise missiles, aircraft and other highly sophisticated threats. HMS Argyll, commissioned in 1991, is the first Type 23 to undergo the life-extension program, and she will conduct further firing trials of the Sea Ceptor system before returning to front-line service, the company added in a news release. Designed and manufactured by MBDA in the UK, Sea Ceptor will also protect the RN’s future Type 26 frigates, and the Land Ceptor will replace the Rapier in British Army service. Traditional air defence systems use semi-active radar guidance, meaning they rely on surface-based fire control radar to illuminate the missile’s target. By using an active radar seeker and datalink on the missile, CAMM does not require the dedicated fire control radar on which a semi-active system depends, MBDA explained. This not only removes cost and weight from the vessel, it makes integration simpler and means that Sea Ceptor can intercept more targets simultaneously, and across 360 degrees — something a semi-active system cannot do. Kraken Sonar Systems Inc. has been awarded a contract valued at over $425,000 by Atlas Elektronik Canada. Kraken will supply and integrate its AquaPix Miniature Interferometric Synthetic Aperture Sonar and Real-Time SAS Signal Processor on the Atlas SeaCat autonomous underwater vehicle (AUV). AquaPix is designed for operation on AUVs and towed platforms. The modular system uses the latest electronics, transducer arrays and signal processing software optimized for the demanding size, weight, power and cost constraints of unmanned maritime vehicles, according to the companies. SeaCat is an approximately three metres in length and 280 kg (depending on configuration) mid-sized, modular, hybrid AUV that provides remotely operated vehicle (ROV) and AUV capabilities “as a truck” to the operating theatre. Universal Switching Corporation of Burbank, California has been selected by General Dynamics Canada to support the Canadian military’s Mercury Global project. The Mercury Global project is the name given to Canada’s participation in the Wideband Global Satellite (WGS) constellation being built by Boeing. WGS will provide high-capacity, assured and secure satellite access for communications that are vital to the Canadian government and military. Universal Switching Corporation says it has been selected to supply the critical data distribution for the satellite command and control systems. Under the contract, General Dynamics Canada is responsible for the construction and installation of seven anchor stations across Canada. General Dynamics C4 Systems Satcom Technologies will manufacture the anchor station antennas, the firms noted. Honeywell Aerospace in Cambridge, Ont., is laying off employees because of a downturn in the space and satellite industry. Honeywell is not providing any information on the numbers of employees being laid off. Sources, however, told 570 NEWS in Cambridge that over 140 of the 400 employees at the facility were let go. The facility is the former COM DEV, which has been building satellite components and space equipment for almost 40 years. The Canadian company was purchased in 2016 by the U.S.-based Honeywell. Department of National Defence employees ramped up their protest against the federal government’s decision to award a long-term maintenance contract to French defence company Thales. Around 150 members of the Union of National Defence Employees (UNDE) blocked the road leading to the main entrance of CFB Esquimalt, B.C. for about an hour. They were protesting against the Liberal government’s recently announced a $5.2-billion deal to privatize maintenance of the Arctic Offshore Patrol Ships (AOPS) and the Joint Support Ships (JSS). Subsidiaries of Thales were awarded the contract. UNDE says the deal is a risk since it could jeopardize national security and could mean a loss of jobs for public servants who now maintain government ships. John MacLennan, who led the protest on his last day as UNDE president before his retirement, said the union expects the Liberals to try to contract out more federal jobs. He accused the Trudeau government of continuing the privatization agenda started by the previous Conservative government. Defence Minister Harjit Sajjan has said no public service jobs will be lost because of the privatization of ship maintenance. United Technologies is buying avionics and aircraft parts manufacturer Rockwell Collins in a deal considered one of the largest in aerospace history. The total sale will cost United Technologies $30-billion U.S.
What’s the reason behind the purchase? Collins Aerospace Systems will be the name of the new unit, according to United Technologies. Marine Industrial Lighting Systems Ltd. of Mount Peal, NL, received a contract worth over $1-million to provide naval LED lighting. The new energy-efficient lighting is being tested by DND on Her Majesty’s Canadian Ship Toronto. Companies will submit their bids for the Canadian Surface Combatant (CSC) by early November, says a top defence procurement official. Lisa Campbell, Assistant Deputy Minister for Defence and Marine Procurement at Public Services and Procurement Canada, said a final request for proposals (RFP) would be completed by early October and issued to the 12 pre-qualified firms. Companies will have one month after that to put together their bids and submit them. Evaluation of the bids was originally expected to be finished by the end of 2017, but that has been delayed slightly, Campbell told Esprit de Corps. Instead, bids will be evaluated in early 2018 and the winner is expected to be determined later that year. “It doesn’t change our target to start construction, which is still in the early 2020s,” Campbell said. Six hundred questions from bidders have been answered. Canada has pre-approved 12 firms to bid on various aspects of the program, which would see Irving Shipbuilding construct a fleet of new ships for the Royal Canadian Navy. The vessels will form the backbone of Canada’s future navy. Fifteen ships will be built. The cost of the program is almost $62-billion, according to a study released in June by the Parliamentary Budget Officer. That estimate includes costs resulting from development, production, spare parts, ammunition, training, government program management and upgrades to existing facilities. It does not include costs associated with the operation, maintenance and mid-life refurbishment of the ships, other than the spare parts that will be purchased when the ships are built, the Parliamentary Budget Officer noted.